The chaos that followed Wallonia’s refusal to ratify CETA exposed Europe’s inability to reflect on the question of sovereignty and where it really resides, writes Amandine Crespy. Amandine Crespy is a lecturer in political science and European studies and the academic coordinator for the Masters in European studies at the francophone Free University of Brussels. The recent free trade agreements negotiated by the European Union – notably CETA and TTIP – have triggered spirited opposition. 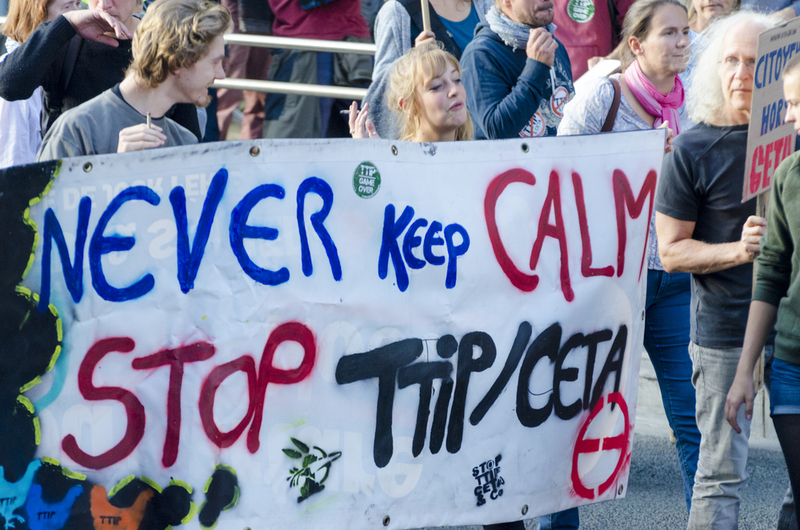 While TTIP has been the subject of protests for several years, the latest episode of the free trade saga put the Belgian region of Wallonia under the spotlight as its parliament refused to approve CETA. This blocked Belgian ratification and led the deal to what looked like a dead end. Beyond the potential winners and losers of free trade, the very question of sovereignty in the Europe was at stake. According to the treaties of the EU, free trade agreements fall under the common EU commercial policy. This means that the European Commission has been conferred the competence to negotiate such agreements directly with the EU’s trade partners, under the supervision of the Council. With the entry into force of the Lisbon Treaty in 2009, the European Parliament gained the power to ratify or reject such treaties. Yet, against the background of the Brexit, the member states managed to make the European Commission concede that CETA was not a classic trade agreement but a “mixed” agreement, which falls under both national and EU competence. Hence, the deal required the approval of all national parliaments, as well as regional parliaments in certain federal states. This explains why, in Belgium, Wallonia was in a position to block the ratification process. From a democratic point of view, this return to national and sub-national parliamentary sovereignty could be welcomed. But the reality is not so simple. The narrow and arguably outdated conception of sovereignty in the European framework raises new democratic dilemmas. Should the Walloon parliament, representing 3.5 million people, be entitled to prevent a policy affecting 510 million Europeans? This view may explain the enormous pressure applied to Paul Magnette by the European Commission and others this week, involving rumours of threats about a possible retaliation in the allocation of EU structural funds to Wallonia. And what about national sovereignty? After all, isn’t it the responsibility of the Belgian federal government to sort out the mess and ensure national ratification? This is a bitter pill to swallow for the ruling Flemish nationalists. As the main advocates of the devolution of powers to the Belgian regions, they can hardly now call for the federal government to ignore the decision of a regional parliament. The EU’s democratic experiment turned into a brutal confrontation of power relations. In the European Union, democratic sovereignty is often understood through the idea of national sovereignty, a historically contingent but intellectually deep-rooted notion combining the territory, the people, the nation and the state. The supremacy of state sovereignty over popular sovereignty cannot be taken for granted. National governments in Europe regularly invoke the notion of national sovereignty and the legitimacy conferred by this principle while using the political and institutional opacity of EU decision-making to take increase the distance between citizens and power. This week’s controversy about the future of CETA could not have been a clearer illustration of this. One may wonder: what is it in the treaty that led a majority in the Council to demand the renationalisation the EU competence on trade policy and the re-establishment of a right to national – or regional – veto? But Guy Verhofstadt’s assertion that the Council may decide to requalify the agreement as an exclusive EU competence raises even more concerning questions. Does this mean that parliaments are only welcome in the decision-making process as long as they agree with deals negotiated by governments and bureaucrats, out of reach of any kind of public debate? The erratic decision-making process over free trade agreements is only one symptom of the EU’s democratic instability. This instability is fed by a collective inability to reflect on the notion of sovereignty and the question of its position in today’s Europe. First, there has to be a collective understanding that sovereignty does not reside directly in any institution, be it a state, a government or a parliament. Institutions are only here to serve or allow the exercise of sovereignty by citizens. Second, this should lead to the recognition that in today’s Europe, sovereignty can only be shared between various institutions at various levels of government, including at European level. Finally, this implies a need for clarification and the development of democratic procedures in cases where different expressions of popular sovereignty clash, such as the Wallonia-CETA episode. Brexit provides a clear answer to the question of national versus European sovereignty in the UK. The future will tell whether this brutal repatriation of democracy will help to effectively enhance popular sovereignty. For those who do not want to go the same way, neither denial nor rear-guard battles will help move European democracy forward. The CETA case tells us nothing because Wallonia is just the silly punchline of the sick joke called Belgium. Wallonia is a failed region by any standard and it says a lot when the main political adversaries are Marxists and unreformed Socialists. This place has just fallen out of time. The real debate has to be about a democratic EU. Starting point has to be the acceptance of the fact that the nation states have no answers to most problems, even if their politicians, media and academics still want to believe that. Let 500 Mio. Europeans elect the Commission President directly in a uniform election. This President would have far more legitimacy than the President of France or the German Chancellor and it would show immediately. Have each Commissioner elected in a direct national election, following the same rules. These Commissioners would have more legitimacy than the guys in COREPER who are totally unknown and who take their instructions by phone from the capitals. This would also make the Commission less of a closed shop. Elect the EP in one European general election, on the same day and with the same rules. Thus the EP would finally become a real parliament und not an assembly of yet another bunch of national representatives. Finally, introduce majority voting in the Council in all areas. 51% of the states representing at least 51% of the EU population are a democratic majority. Who could possibly object to such rules? Certainly only someone who does not think European.